Bengal, Siberian, Sumatran, Malayan, Indochinese and South China Tiger. 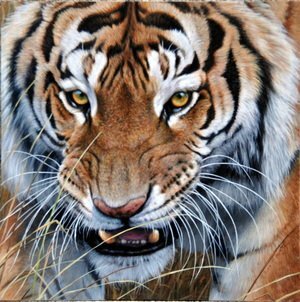 See some of Alan's Tiger Paintings below. Tigers are the biggest of the big cats. The largest races of tigers tend to live in the cooler, northern parts of their range and have thicker, paler fur, the Siberian tiger being the biggest of them all. 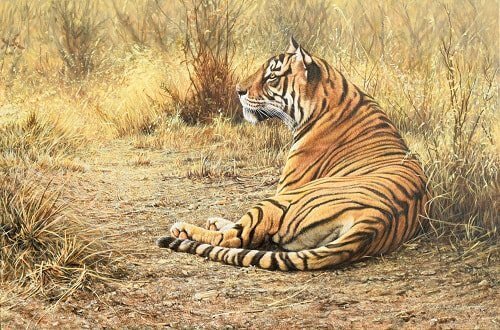 Tigers are happiest living in forests where there is plenty of cover to stalk their prey, but they are also fond of water and are accomplished swimmers something I have featured in quite a few paintings. 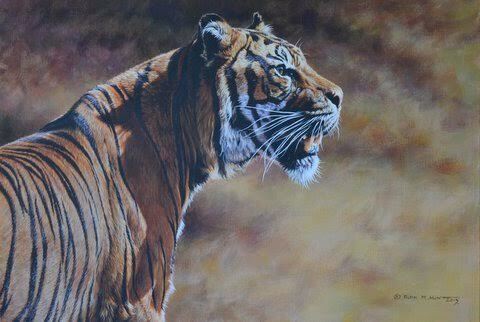 ​"Even in tiger reserves, human encroachment and poaching is increasing and I fear that tigers may be extinct within the next 100 years"
New Original "Too Alert" 21" x 33"
The tiger (Panthera tigris) is a member of the Felidae family; the largest of the four "big cats" in the genus Panthera. 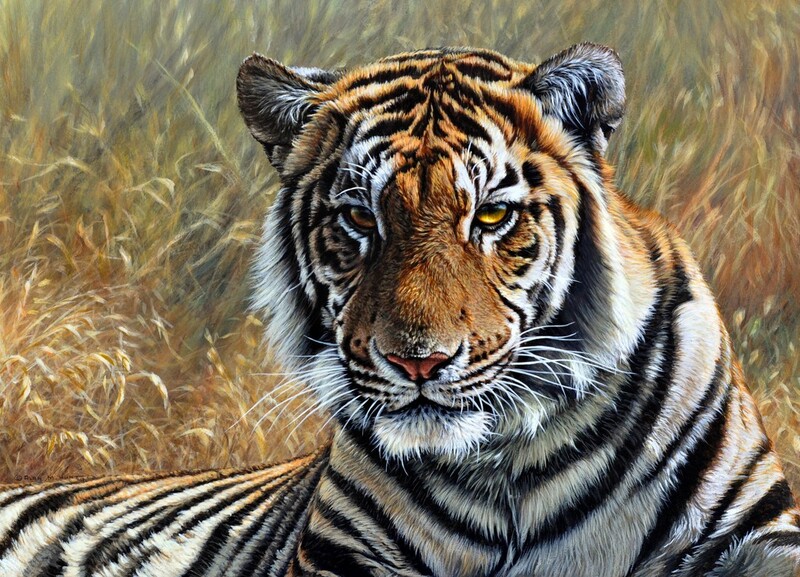 Native to much of eastern and southern Asia, the tiger is an apex predator and an obligate carnivore. 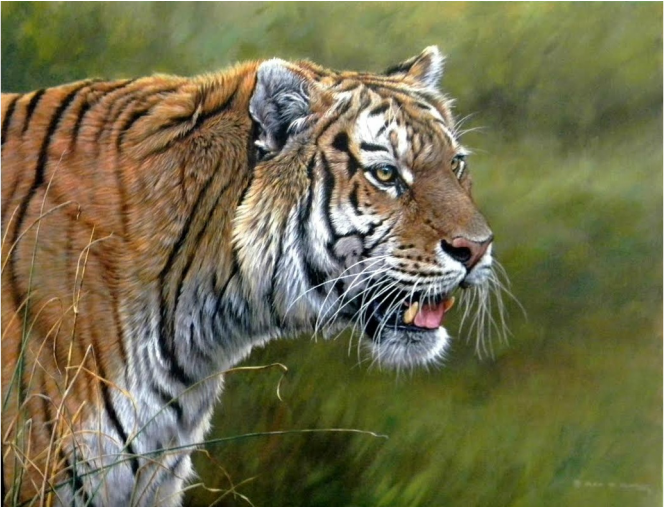 Reaching up to 3.3 metres (11 ft) in total length and weighing up to 300 kilograms (660 pounds), the larger tiger subspecies are comparable in size to the biggest extinct felids. Their historical range, which once reached from Mesopotamia and the Caucasus through most of South and East Asia, has been radically reduced. While all surviving species are under formal protection, poaching, habitat destruction and inbreeding depression continue to be threats. 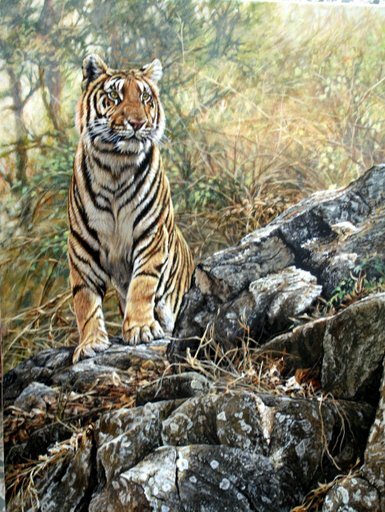 Tigers have been classified by scientists into eight subspecies: Indian (or Bengal), Indo-Chinese, Sumatran, Amur (or Siberian), South China, Caspian (extinct), Java (extinct), and Bali (extinct). One of the most powerful land carnivores in the world , the tiger is a massively built cat of awesome size and power. The Siberian Tiger is the largest cat in the world. The biggest one ever recorded was 1,025 pounds, while the average weight for male Siberian Tigers is 500-900 pounds. Male Siberian Tigers are usually about 3.5 feet tall at the shoulder and about 13 feet long from nose to tail. The Siberian Tiger can run up to 50 miles per hour over the snow if they want to. That's only 10 miles per hours slower than the cheetah (the fastest cat in the world)! Diet: Carnivore; deer, elk and small animals? Tigers Lifespan: About 15 years in the wild; 20+ years in captivity. Most tigers have more than 100 stripes, and no two tigers have identical stripes. Did you know? A group of tigers is called a streak. There are probably fewer than 500 Sumatran tigers on the island of Sumatra. Amazing: The roar of a tiger can be heard more than a mile away.